Do you love sweet potato soup? This creamy, healthy soup hits the spot on a cold autumn or winter night. Pair it with a sandwich or salad for an easy weeknight dinner. 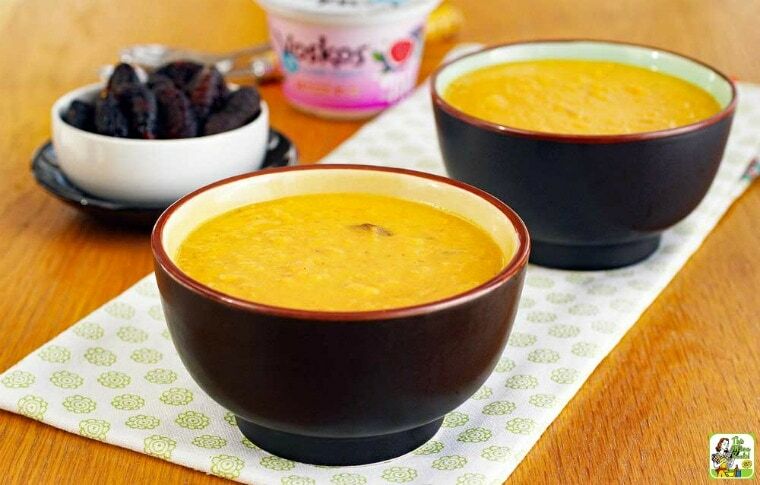 This sweet potato soup recipe uses Greek yogurt and a secret ingredient – figs! You’ll love the combination, trust me. 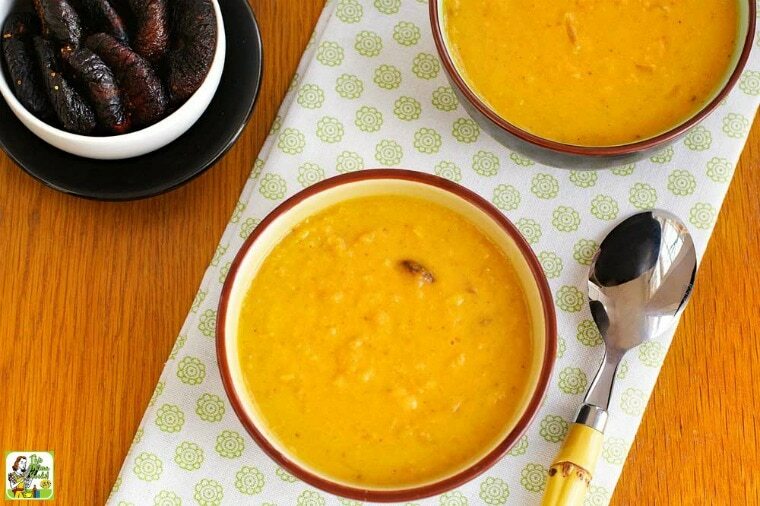 This vegetarian sweet potato soup is perfect for Meatless Monday, too! I’m a big fan of Greek yogurt as a healthy substitute for sour cream. So when I saw VOSKOS Nonfat Exotic Fig Greek yogurt at the store, I had to try it in my sweet potato soup recipe. I love figs, both dried and fresh. I love using slices of fresh fig on goat cheese pizza or eating dried figs as a healthy snack. Plus, figs bring much nutritional goodness to sweet potato soup recipes since they’re rich in minerals and packed with potassium, calcium, magnesium, iron, copper, and manganese. This soup is kind of a curried sweet potato soup, but if you’re not a fan of curry powder, you can substitute a tablespoon of Herbes de Provence instead. The traditional French herbs go well with both the sweet potatoes and figs. Either way you prepare it, this soup is delicious! Keep the size of the diced sweet potato and parsnips fairly small. The smaller the dice, the shorter your cooking time. To get the creamiest soup possible, use a hand blender to puree the sweet potatoes, parsnips, and onions. It’s worth the extra effort. If you’re gluten free, make sure your vegetable broth is certified as gluten free. Check the label and packaging carefully! When using coconut milk, make sure to buy lite coconut milk. 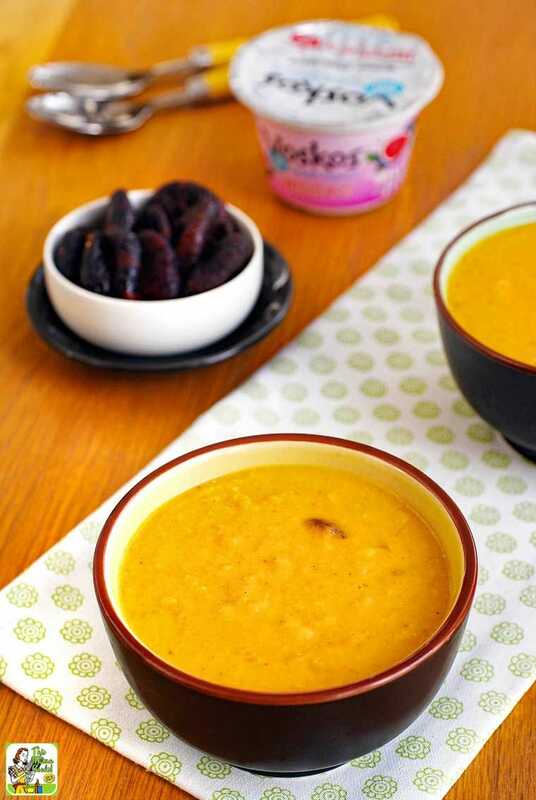 There’s no reason to go full fat because once the Sweet Potato Soup with Figs is pureed, it’s deliciously creamy. If you wish, you can use the equivalent of 14 ounces of coconut milk from a carton. Just make sure it’s the unsweetened and unflavored variety. Please, no sweet vanilla coconut milk! Otherwise, you might as well be making a sweet potato smoothie. If you’re not a fan of coconut milk, you can use non-fat evaporated milk as a substitute. In a large saucepan, heat olive oil over medium heat. Add onion and curry powder and cook for 5 minutes, stirring occasionally, until onion begins to be translucent. Add sweet potatoes and parsnips to the pot. Stirring constantly, cook for another 5 minutes. Add vegetable broth to the pot and increase the heat to medium high. Cover and bring to a boil. Reduce heat and simmer with lid on, stirring occasionally, for 15 minutes. Add figs and salt to the saucepan and cook for 5 minutes or until all vegetables are soft. Stir in coconut milk and Greek yogurt. Return saucepan to stove on medium heat and heat soup through. Do NOT let the soup boil! Originally posted on January 21, 2013. Updated with new pictures and information. Posted in Gluten Free, Recipes, Soups, Veggies and tagged Meatless Monday, potatoes, vegetarian, yogurt on February 7, 2018 by Anne-Marie Nichols. Perfect winter recipe. 😀 Thanks lot for sharing. It sounds really yummy and warm.